"KY-1" redirects here. For the state route, see Kentucky Route 1. 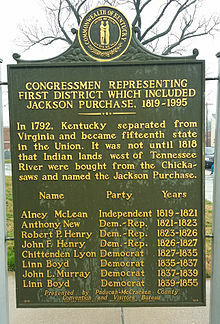 Sign in front of the McCracken, Kentucky Courthouse (in Paducah, Kentucky) commemorating early members of the U.S. House of Representatives representing Jackson Purchase (U.S. historical region). The "First District" in the title actually changed over time. It refers to the Jackson Purchase, which was in the 5th district from 1819 to 1823, the 12th district until 1833, and then the 1st district until the end of the sign's lineage in 1855. Kentucky's 1st congressional district is a congressional district in the U.S. state of Kentucky. Located in Western Kentucky, the district takes in Henderson, Hopkinsville, Madisonville, Paducah, and the college town of Murray. The district is represented by Republican James Comer who won a special election to fill the seat of Rep. Ed Whitfield who resigned September 2016. Comer also won election to the regular term to begin January 3, 2017. Although Democrats have an almost 2-to-1 edge in registration and still hold most local offices in the district, they tend to be very conservative on social issues, a trend which favors Republicans at the federal level. As of September 2013, there were 505,870 registered voters: 302,406 (59.77%) Democrats, 174,137 (34.42%) Republicans, and 29,327 (5.80%) "Others". All of the "Others" included 21,711 (4.29%) unclassified Others, 7,011 (1.39%) Independents, 419 (0.08%) Libertarians, 93 (0.02%) Greens, 65 (0.01%) Constitutionalists, 19 (0.0038%) Reforms, and 9 (0.0018%) Socialist Workers. Until January 1, 2006, Kentucky did not track party affiliation for registered voters who were neither Democratic nor Republican. The Kentucky voter registration card does not explicitly list anything other than Democratic Party, Republican Party, or Other, with the "Other" option having a blank line and no instructions on how to register as something else. Kentucky counties within the 1st Congressional District: Adair, Allen, Ballard, Caldwell, Calloway, Carlisle, Casey, Christian, Clinton, Crittenden, Cumberland, Fulton, Graves, Henderson, Hickman, Hopkins, Livingston, Logan, Lyon, Marshall, Marion, McCracken, McLean, Metcalfe, Monroe, Muhlenberg, Ohio, Russell, Simpson, Taylor, Todd, Trigg, Union, and Webster. March 3, 1795 Elected September 7, 1792. March 3, 1803 Elected in 1797. March 3, 1811 Elected in 1803. March 3, 1813 Elected in 1810. Redistricted to the 5th district and retired. August 1816 Elected in 1812. Leave of absence April 8, 1816. March 3, 1817 Elected to finish Clark's term. March 3, 1823 Elected in 1816. March 3, 1835 Redistricted from the 12th district. Retired to run for U.S. Senator. Redistricted to the at-large district. October 10, 1936 Redistricted from the at-large district. Lost renomination and then resigned. September 6, 2016 [Data unknown/missing.]. Retired and then resigned early. Present Elected to finish Whitfield's term. Also elected in 2016 to the next term. As of June 2017[update], there are two living former members of the House from the district. The most recent to die was Thomas Barlow (served 1993–1995) on January 31, 2017. ^ Geography, US Census Bureau. "Congressional Districts Relationship Files (state-based)". www.census.gov. ^ Bureau, Center for New Media & Promotion (CNMP), US Census. "My Congressional District". www.census.gov. ^ "Partisan Voting Index – Districts of the 115th Congress" (PDF). The Cook Political Report. April 7, 2017. Retrieved April 7, 2017. ^ "Registration Statistics: By Congression District". Kentucky State Board of Elections. September 2013. Retrieved February 6, 2014. ^ "Registration Statistics: Other Political Organizations and Groups". Kentucky State Board of Elections. September 2013. Retrieved February 6, 2014. ^ "Kentucky Administrative Regulations 31KAR4:150". Kentucky Legislative Research Commission. November 2005. Retrieved February 6, 2014. ^ "Register To Vote". Kentucky State Board of Elections. August 2003. Retrieved February 6, 2014. Martis, Kenneth C. (1989). The Historical Atlas of Political Parties in the United States Congress. New York: Macmillan Publishing Company. Martis, Kenneth C. (1982). The Historical Atlas of United States Congressional Districts. New York: Macmillan Publishing Company.